How does strengthening your core and improving your posture while sitting (and working!) sound?! I love telling all of you about products that I’ve found and think that you could benefit from! It’s been a while since I shared something like this but this one is good! I’m sure you’ve heard of a balance ball, right? Well, did you know there is a balance ball chair?! I’ll be honest with you, I’ve had mine for quite a while but only started using it over the last few weeks and I am in LOVE. The one that I have is the Gaiam Custom-Fit Adjustable Balance Ball Chair. I do work at home so I have the flexibility to get up and move around often but I still find myself glued to my computer screen. I discovered that this existed because I was on the hunt for something that would make the time I spend sitting a little more useful and help with my posture since I tend to slouch at my desk. Below is my setup. 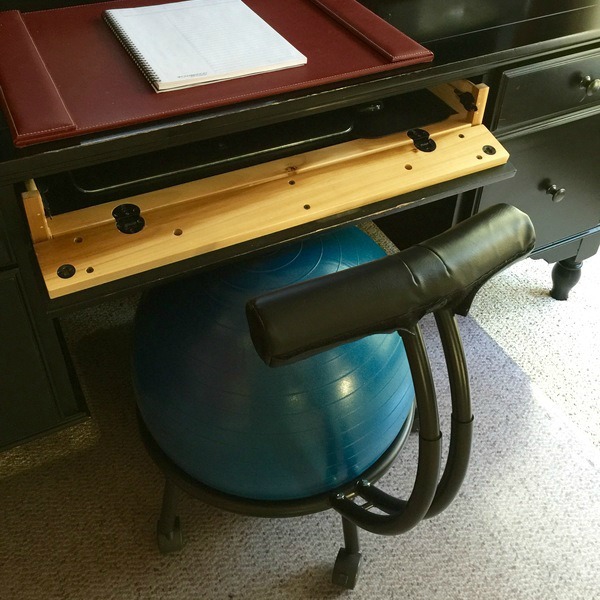 I usually take my “real” office chair into a different room so I’m not tempted to switch away from the balance ball chair! 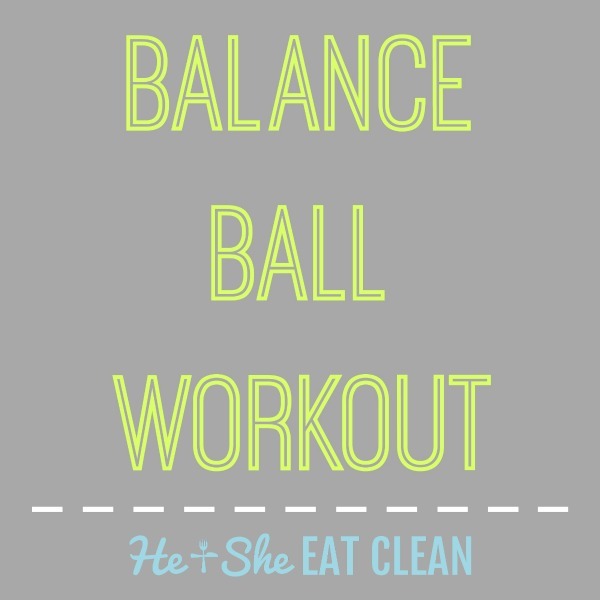 It’s very easy to remove the balance ball itself so not only do you have a balance ball chair but you also have a balance ball to use for your workouts…which is precisely why I created a workout for you to try with yours (you’ll also find exercise balls used in the at-home versions of our She Sweats Workout Plans)! One of the best things about an exercise ball is that you can still get a good workout without weights but I’ve also included some moves to try if you do have access to weights! I’ve listed some of my favorite moves below and also put them into a workout for you to try. Remember to engage your core the entire time during these moves to really get an effective workout! Hold the balance ball over your head or straight out in front of you (to also engage your core and arms) and perform a regular squat. Use the ball to do incline (hands on the ball) or decline (lower legs on the ball) push-ups. Place your feet on the floor and lower back on the ball and perform a regular crunch. Place the ball between your back and a wall. Lower yourself until you are in a seated position with the ball behind your back. Place your feet on the floor and lay with your lower back on the ball and perform regular chest presses. Place your feet on the floor and perform shoulder presses while sitting on the ball. Place your feet on the floor and perform tricep extensions while sitting on the ball. Place your feet on the floor and lay with your lower back on the ball and perform regular chest flyes. Place your feet on the floor and perform bicep curls while sitting on the ball. 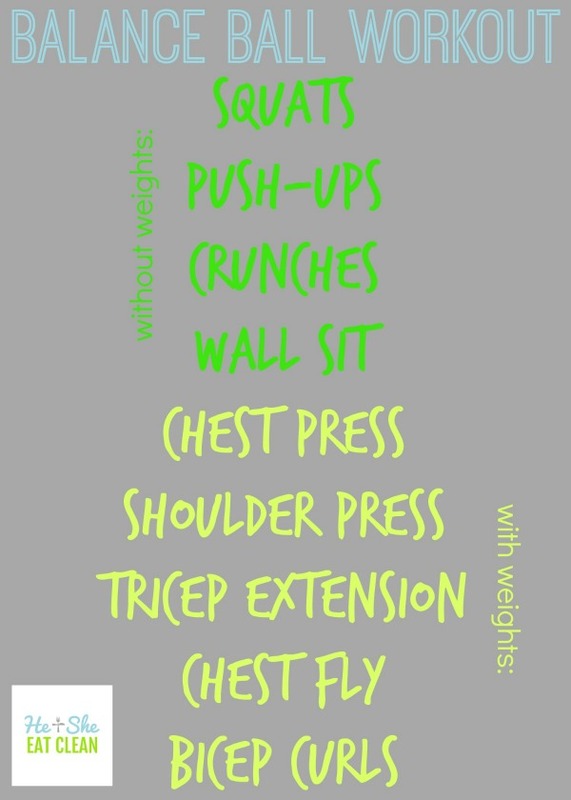 You can arrange these moves as you would like (depending on if you have weights or not) but below is my favorite sequence. 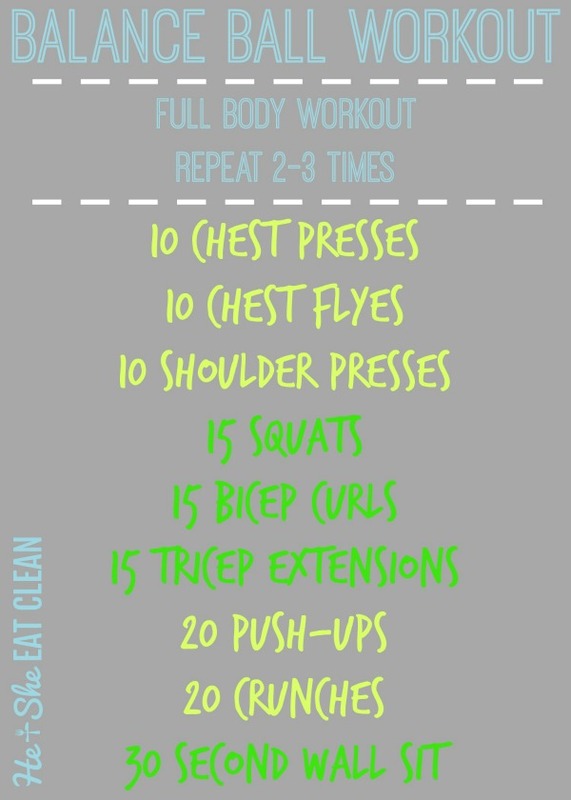 I hope that you enjoy this workout and also consider an alternative to sitting in a regular office chair. Even if you only swap out a few hours per day using the balance ball you will be pleasantly surprised at how much better you feel. « Introducing the NEW He and She Eat Clean!